Do you feel that the quantity of stuff at your place is too much of a work for you to handle alone? Do you fear that you could break some of your items or even damage them while moving them out of your old residence? More importantly, do you get the feeling that this work is way beyond your expertise to pull off? If the only reply that comes to your head is a YES, then it is time you contact a reputed removalist company and get it done in the best possible manner. 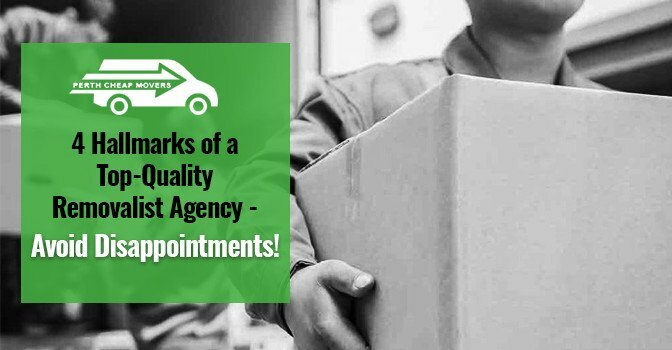 However, if you are new to such services, then being aware of the key hallmarks of a quality agency does reduce your workload considerably. When discussing the hallmarks of top-rated companies providing removals in Joondalup, the first thing which comes to mind is – No Hidden Charges. What You See Is What You Pay. These reputed removal companies will always keep their rates as per industry-standards and WILL NEVER MAKE YOU PAY THAN NEEDED for your shifting purposes. When it comes to Planning, Organising and Executing Relocation operations; experienced removalists know exactly what they need to do. Their Experience And Ability To Handle Your Items Is Something You Can Use To Your Advantage. Whether it’s handling fragile items, very old furniture sets, heavy cabinets, tables or bed, they will bring all the necessary tools and packing items (duct tapes, plastic sheets, bubble plastic wraps and different sized boxes). From arranging all your items (and seeking your opinion about items to be left behind) to packing them in boxes (with the proper cushioning) to loading them up; you can be assured that EVERYTHING WILL BE HANDLED TO PERFECTION. Another noticeable trait of A-grade agencies providing licensed movers in Warwick is they will cater to all sorts of moving operations. Visiting their website, you will find these agencies catering to all kinds of removal requirements. These top agencies will leave no stones unturned to ensure that your items are safely transferred to your new location without harm. Last, but not the least, you will always find quality relocation agencies having a friendly and actively responsive customer-care staff. No matter the Situation, Quantity and Difficulty; you can rely on these companies and call them up whenever you need help in shifting items. If anything, you only need to MAKE A SINGLE CALL, and these agencies will send down their men to your residence WITHIN AN HOUR. That testifies their dedication and professionalism towards you. So, Are You Planning For Your BIG MOVE? If so, then quickly get in touch with an acknowledged removalist company and Make Your Hectic Shifting Effortless and Tension-Free! As a recommendation, you can speak to the experts of ‘Perth Cheap Movers’ about your relocation plans. Their professional removalists will come to your rescue whenever you need.